WIND SHEAR, AND WARM SEA SURFACE TEMPERATURES (28-30 CELSIUS). Where are you finding the BoM Track map RD? Still nothing on the tropical cyclones page. The next Information Bulletin will be issued by 11 am AEST today. Be nice if it came ashore as a broad low loaded with rain. The next Information Bulletin will be issued by 5 pm AEST today. Here is a time-lapse of satellite images from the last 24 hours. Great to see something of interest so early in the season! Certainly been looking impressive on satellite imagery this morning with healthy solid convection, upper level outflow to its south, and some transverse banding in the cirrus. 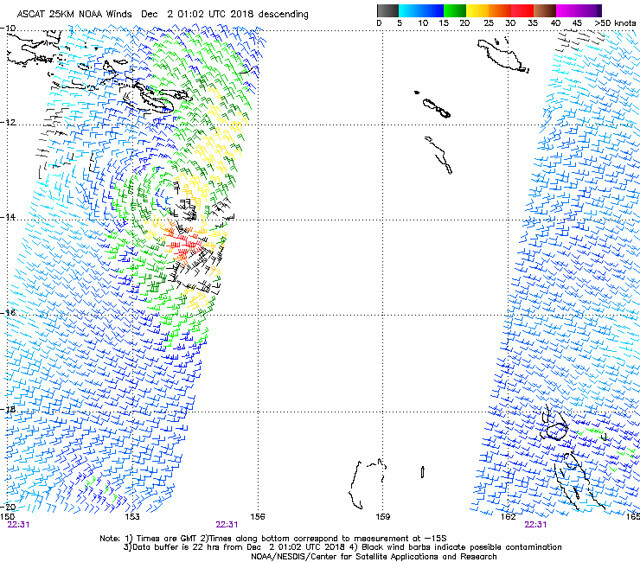 1st image - Latest ASCAT satellite wind pass (at 11:02am) suggested most of the strongest winds (> 25-30kt) were still confined to its southern flank which is what you'd expect with the tighter pressure gradient to the south. There is an %50 to %50 chance of this one turning into an cat 3/cat4 later in the week if it's does do that or not. We will know over the next few days time or this evening maybe. 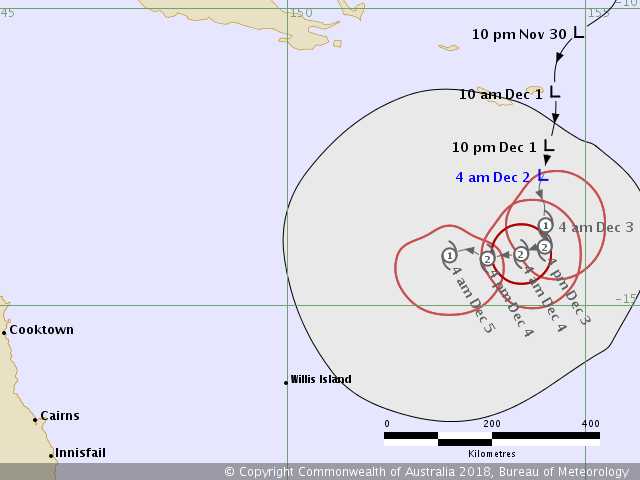 Yeah Mathew, its probably gonna hit Townsville as a Cat 4. But it might not either. 50/50 P.s. Some cloud and rain would be welcome the rivers need a good flush out. Owen it is then.Welcome to the world. Tropical Storm Owen. We might even get a tightening in the pressure gradient to warrent 25 knot winds. Fingers crossed for some rain. Here is a sea surface temperature chart from this morning's data from NOAA. 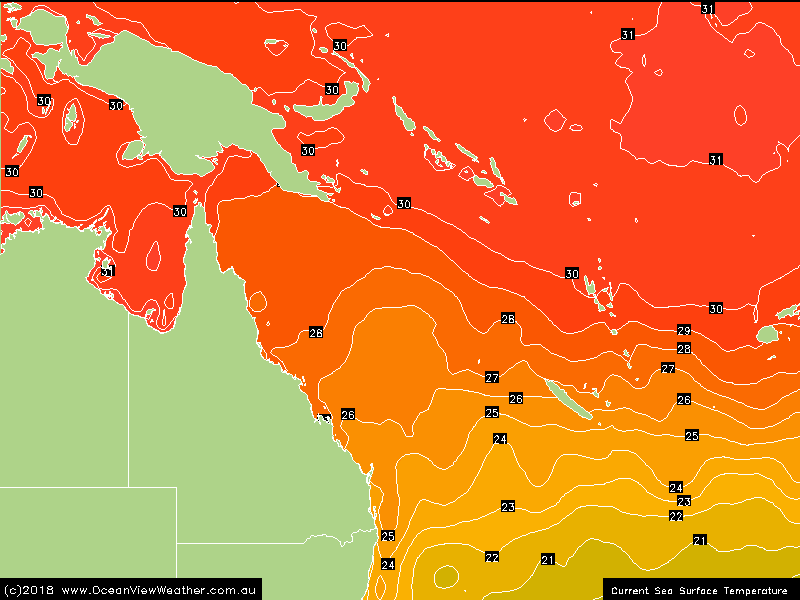 Quite warm in the northern areas of the Coral Sea and warm enough for some more formation. 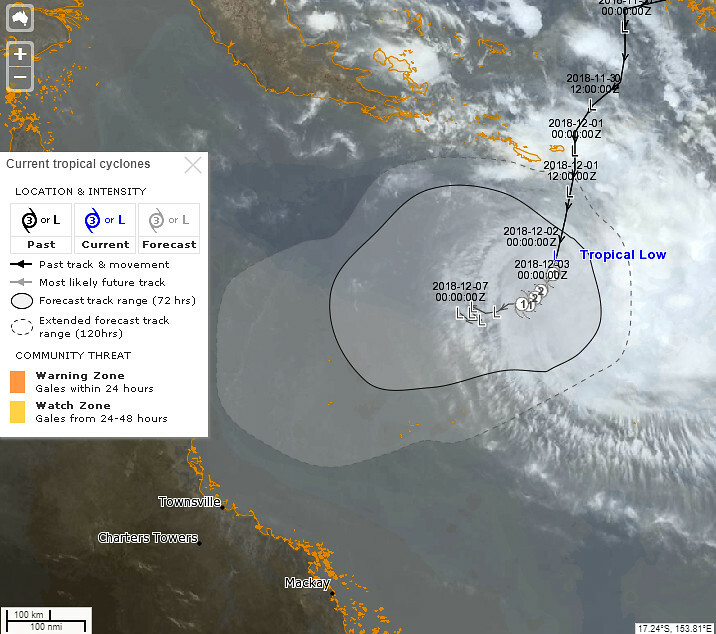 How bloody ridiculous naming a low pressure system a cyclone when the central pressure is 998 hpa and winds of 25kts. I really think around 990 hpa would be more like the start point.